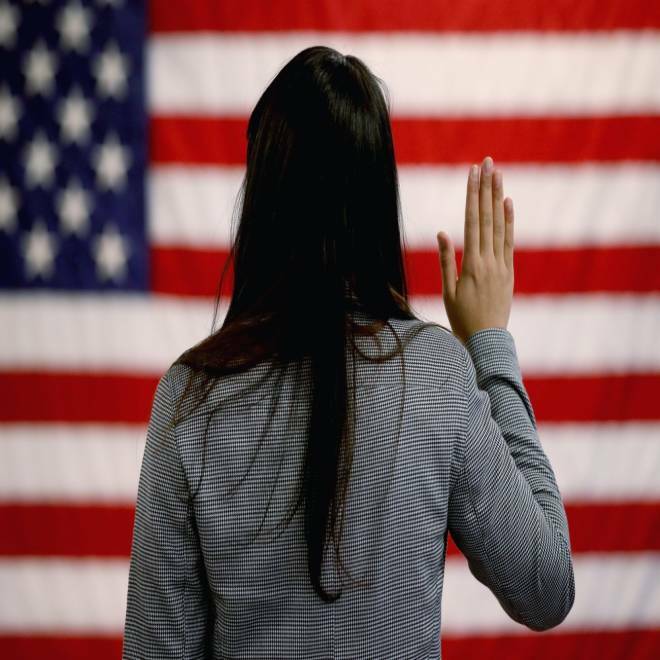 A woman takes the oath of allegiance during a naturalization ceremony in Newark, N.J., in January. This is the first story in NBC News’ series “Immigration Nation,” an in-depth examination of immigration in America. The talk about reforming the American immigration system has focused on getting 11 million undocumented workers on the path to citizenship. It’s a simple idea that obscures a thorny truth. There is no single path to citizenship. There are hundreds. Which path you take can depend on who your relatives are, whether you are safe in your homeland or how good you are at your job — in the case of one Canadian burlesque dancer, whether you can prove that you twirl your tassels in a truly unique way. Which path you take can depend on where you come from and how you’re trying to get here, on the whims of the federal government and on the laws of supply and demand. You can set out on a path through your family or your job, as most immigrants do — hitching your hopes to a citizen brother or sister, or to an employer willing to be a sponsor. You can take up arms for what you hope will one day be your country. Or you can win the lottery: Up to 55,000 spots each year go to people who line up for hours in far-flung places like Bangladesh or Kazakhstan to enter a drawing and try their luck at a new life. So what happens once you choose your path? There are at least 4.4 million people whose first-step visa petitions have been approved and are waiting for a green card that would grant them permanent residency, the vast majority trying to enter with help from relatives in the United States, according to the State Department. But that hardly means the path to citizenship is clear. Any number of obstacles can block the way. You can fall in love with an American citizen and move to a different path. You can be kicked off the path. Or the path can shift on you. 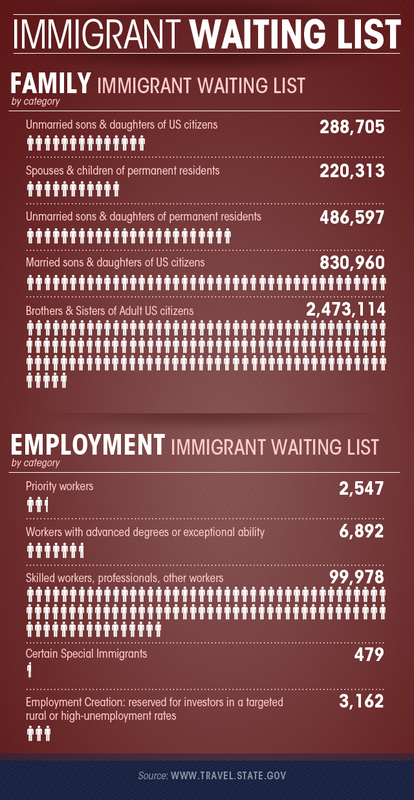 Nearly 700,000 immigrants take the step to U.S. citizenship each year. Meet some of those who have just become part of that select group: Americans. That is what happened to Sergio Garcia of Mexico, who has been waiting 19 years. His father, a retired California farm worker, sponsored him for an immigration visa in 1994. At that point, the father had a green card, and the son had crossed the border without documentation, in the back of a truck. For Garcia, Nov. 18, 1994, is what is known in the system as a priority date. To would-be immigrants, it means everything. When enough of the backlog has been cleared and your date comes up, you can take the final steps toward a green card. More than a decade ago, enough of the backlog had been cleared for Mexicans in his immigration category that the priority date was Nov. 12, 1994 — just six days from his date. Then the line jumped back three years, as it can when immigration officials work through a glut of cases. Since then, on the 15th of each month, Garcia has logged on to a State Department website to read the latest visa bulletin, to see whether he is any closer. Garcia said that if he had known at the beginning that it would take two decades to get his green card, not the three to five years he was told, then he would have returned to Mexico. Click the graphic for a larger version (new window). The United States admits up to 675,000 immigrants legally each year, including up to 480,000 who are related to American citizens but are not spouses, minor children or parents, according to the Department of Homeland Security. That figure includes 47,250 slots for each of the countries with the highest demand, including Mexico, the Philippines and India. 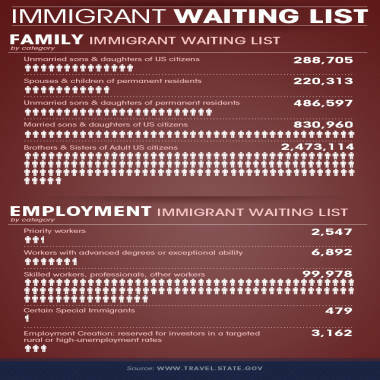 Demand from these places far outstrips the supply of immigration slots. From Mexico alone, the theoretical line is 1.3 million people long. If you are emigrating from the Philippines through a brother or sister who is a U.S. citizen, and you are getting your green card today, you got “in line” about the time the Berlin Wall came down. And the green card is only the first step, entitling you to a five-year wait for full citizenship. In the interim, you can be rejected for a variety of reasons, including bounced checks, clerical errors on your application or adultery. You can pay to get on a path: 10,000 visas — and ultimately green cards — are reserved for foreign nationals who invest at least $500,000 in an American business, though the program has never reached that number in the two decades it has existed. Some paths are shorter than others. Qualified immigrants who have temporary visas can join the military and become naturalized citizens as soon as the end of basic training. President George W. Bush expedited the military path after the Sept. 11 attacks. And about one in 10 people legally admitted to this country every year is granted entry because of asylum or refugee status, and a one-year path to a green card, after proving a legitimate fear of persecution at home. That happened to Parvaneh Vahidmanesh, who was in the United States on a visa when Iran was engulfed by violent protests after the disputed 2009 presidential election. In an open letter in The Wall Street Journal addressed to Iran’s supreme leader, Vahidmanesh demanded to know why a bullet was the answer to peaceful cries of opposition. 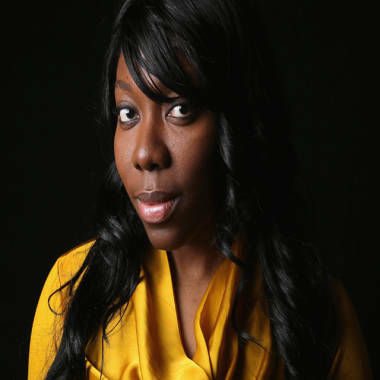 The United States deemed it too dangerous for her to return home. Vahidmanesh applied for asylum after the Journal letter was published, was granted asylum in September 2009, got a green card a year later and is waiting to become a citizen. She said that she feels accepted in the United States, never like a foreigner or even a guest. The immigration reform plan being devised in Washington, chiefly by four senators from each party, is expected to provide a means for the estimated 11 million who entered the United States illegally eventually to become citizens. Precisely how is far from clear, as is whether the plan would include an unspecified “trigger” requiring that the U.S.-Mexican border is declared secure before any citizenship program for the undocumented can begin. It is also expected to include some kind of guest-worker program allowing low-skilled workers to remain in the United States. Supporters of tighter immigration controls have concerns about both elements, but most acknowledge that the country needs far more clarity on who should and should not be eligible to become an American citizen. 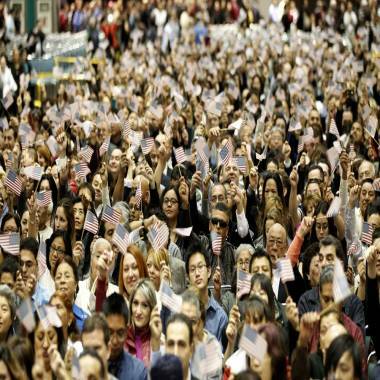 Candidates wave U.S. flags during a naturalization ceremony to become citizens in Los Angeles in February. 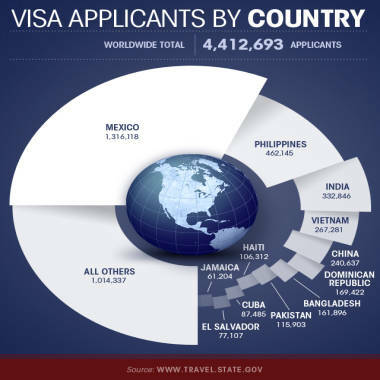 Some advocates of a more permissive immigration system say that the central problem is that the United States does not issue nearly enough visas. 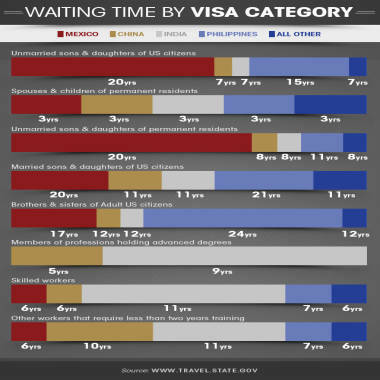 Even if the United States stopped approving new requests for family-based immigration visas today, it would take 19 years to clear the backlog of people waiting to join a relative in the United States, according to the Migration Policy Institute, a nonpartisan research center. As Garcia waits for his priority date, his shot at citizenship, he figures there is no turning back. As strange is it may sound, he said, he believes that his father was right to encourage him to embark on the path to citizenship. Petra Cahill, Tracy Connor and Miranda Leitsinger of NBC News contributed to this report.